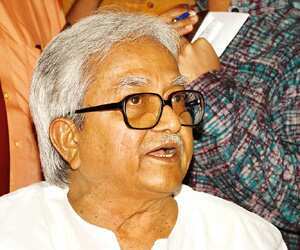 Politically correct: Biman Bose, a member of the CPM politburo, says that the party has launched a ‘rectification campaign’. Indranil Bhoumik / Mint. Kolkata: When on 31 August the Communist Party of India (Marxist), or CPM, organized a huge rally in Kolkata to commemorate the food movement of 1959, it revived an old practice of collecting food from the homes of its supporters in the city for distribution among party workers who had travelled from elsewhere. It was the CPM’s way of connecting with the people through the 1970s and 1980s, which the party had abandoned in more recent years, perhaps decades. In those days, the CPM couldn’t afford to feed the hundreds of thousands of supporters who came to Kolkata to attend party rallies. So, workers in Kolkata and its vicinity went door-to-door collecting contributions of roti and jaggery. After several poll debacles starting with the panchayat, or village council, elections in 2008 that stretched into the Lok Sabha polls this year, the CPM revived the practice with the aim of rebuilding contact with both people who continue to support the party and those who have distanced themselves from it. “The response was good," says Biman Bose, a member of the CPM politburo—the party’s highest decision-making body—and its state secretary for West Bengal. The CPM has launched a “rectification campaign" for party workers ahead of the 82 civic body elections due in 2010 and the crucial assembly elections the year after. The campaign is aimed at correcting any political, ideological and organizational lapses and reconnecting with people who had become estranged from the party. Such campaigns are essential for the “health and hygiene" of the party, says Bose. “But because of frequent elections, we were unable to run such campaigns." The CPM launched a similar campaign some 13 years ago. As a first step, the party is trying to identify from among its 375,000-odd members how many have distanced themselves from day-to-day operations. “We are trying to understand why they are not taking interest in the party’s work. Is it because of illness or old age? Or is it because they have moved away? Based on that understanding, we will decide what to do with these people," Bose said in an interview. In a communiqué to its members released after the state secretariat meeting in August, the CPM said that “in some cases (areas), 25-40% of party members are inactive", including some “key leaders". A large section of party workers have distanced themselves from the “core programmes and ideology" of the CPM, the note said, adding that the CPM needs to launch a “reorientation programme" for its workers. Party workers have been told that they should eschew links with businessmen, especially real estate developers and construction equipment suppliers, says Bose. The August communiqué said a section of party workers, though not large, had exploited their links with the party to build businesses at the cost of the CPM’s credibility. “We have noticed that a section of party members were using their clout for personal gains… Maybe they were doing it for their livelihood," says Shyamal Chakraborty, a CPM state secretariat member. “But it goes against our party’s norms, and we will not tolerate this." Under a back-to-basics reform programme, party workers have been advised not to lead processions on motorcycles brandishing CPM flags because motorcycles do not fit the party’s image—they are seen as a symbol of aggression. “Motorcycles just aren’t needed," says Bose. “If it’s a procession, you are expected to walk. Why should it be led by motorcycles?" Party workers have also been told not to interfere in private disputes. For instance, they have been instructed not to take sides in fights between landlords and tenants. “Why should we get involved? The courts should deal with these problems." But it may be a case of too little, too late. The August note to CPM members says a large section of the party is depressed after the Trinamool Congress-Congress combine won 25 of the 42 parliamentary seats in the state in the April-May general election. “People wanted to teach us a lesson," admits Bose. “But some are already saying this was too much." The Left parties came to power in 1977 because of their dedication to ideology, says Abhirup Sarkar, professor of economics at Kolkata’s Indian Statistical Institute. “But over the years, it has lost that image, and it might be too late for a rectification programme."